The Bank Shot...open for business! A bank shot is simply a shot that comes off the backboard as opposed to directly through the hoop. When you shoot a regular shot, aiming for the hoop, the ball needs to be in line, have good rotation, and have a nice high arc in order to have a higher chance of going in. On the other hand, when you're shooting off the backboard, you're mainly concerned with AIMING. For this reason alone, it is one of the highest percentage shots in basketball. When you’re directly in front of the basket just aim for the white square or slightly above it depending on how hard or soft you shoot or lay it up. When you’re either to the left or right of the basket (not to the side, but at an angle), remember angles, angles, angles. Think about pong or pool, the role angles play in those games. It's not much different here. The more arc/rotation the ball has, the higher you aim on the backboard. 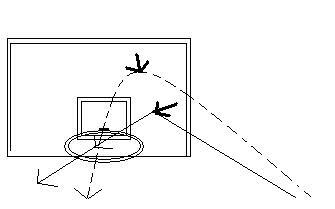 The ---- line is the high arcing shot with rotation, the softer shot. The _____ is the hard direct shot. Utilizing the backboard has become a lost art in basketball today, very few people use it consistently and effectively. Its especially useful when driving into a crowded lane swarmed by defenders. You don’t have to shoot the perfect shot or layup, just shoot it off the board/glass and BOOM! Here's an aweseome video from the Miami Heat, where shooting guard Dwayne Wade talks about the art of the bank shot.